The wave of support by local communities is in sharp contrast to the cruelty that now dominates a system, where the few luxuriate in obscene wealth while the many struggle to survive. It is crystal clear that the shocking casualties in west London were entirely avoidable. Repeated pleas and warnings by residents about fire and safety issues were ignored by arrogant officials. When Grenfell Tower residents warned their landlord, Kensington and Chelsea Tenant Management Organisation (KCTMO). they were ignored, bullied and threatened. “Only a catastrophic event”, residents said last November, would expose the ineptitude and incompetence of their landlord. The Grenfell Tower disaster WAS system-made. It is the result of state de-regulation, incompetence and cost-cutting by councils and the companies in charge of ordinary people’s homes – and lives. The NHS is sold off. Fire services cut for years. Heroic fire fighters are treated like third class citizens. Warnings by the Fire Brigade Union are ignored. Shutting people out of power, with no voice and no say, KCTMO authorised refurbishment techniques which transformed homes into death traps. A report in today’s Times reveals that for a mere £5,000 extra, the external panels could have been upgraded to a fire-resistant version. It was these panels together with the creation of a ventilation cavity, that are thought to be responsible for the rapid spreading of the fire. 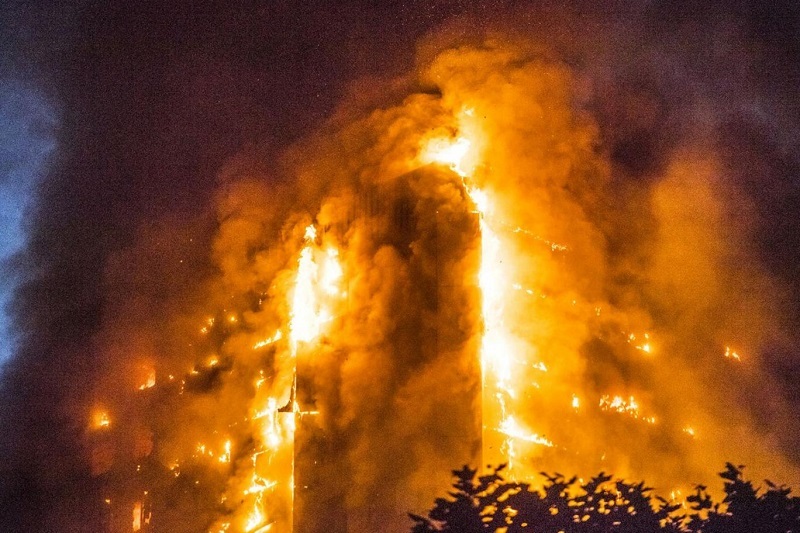 But KCTMO advised residents to remain in their flats in case of fire, instead of using the staircase – a recommendation based on the pre-cladding conditions in tower blocks with only concrete walls. Communities are powerless in the face of faceless and arrogant bodies like KCTMO. Other councils around the country are the same, working hand-in-glove with companies who seek only profit at the expense of good housing and safety for the many. May’s announcement of a public enquiry is a tried and tested technique. She wants to dampen down anger in the hope it will go away. Meanwhile, the true criminals will get away scot-free or run off with a rap across the knuckles. This is not democracy in any shape or form. It is a system that manages people as if they were things, and in the case of the poorest in society, inconvenient things to be shunted around and battered from pillar to post with lives that get harder all the time. We live in a cruel, bureaucratic state. Only the needs of the market count. Humanity is out; only profitability counts. Meanwhile, Corbyn’s humanity seems to be more important to people even than his policies. There has been a huge wave of support by local communities. But outrage and anger alone are not enough. A strategy is needed. Instead of May’s enquiry, there must be an immediate coroners’ inquest in close association with relatives of the dead. To prevent future events of this nature, we urgently need real democracy, where society as a whole is the political form, ending the separation between people and state. The real alternative is to assert power through real and ‘virtual’ assemblies. In this way grass roots people will feel encouraged to act for the common good in a society where any surplus is used for the benefit of all. Let’s turn this week’s protests – today at Marsham Street, this Saturday, and on July 1 into real action to bring down the May government. That includes strike action by unions and communities. Immediately, please sign the petition for a fresh election. Let’s take forward the social movement that began before the election. Let’s transform our democracy. It’s time to pick up on Labour’s Manifesto idea for a constitutional convention and run with it. Thanks, Peter, yes, that is a good suggestion about inquests. They would need to be agreed by the relatives and have real power. It seems that the lagging put on the outside of the block was more to prettify it than for safety or other reasons. The lawyer who represented tenants after the Lakanal House fire that killed 6 in 2009 said on TV yesterday that the best way to achieve justice was to have inquests with juries rather than a public enquiry controlled by establishment judges.